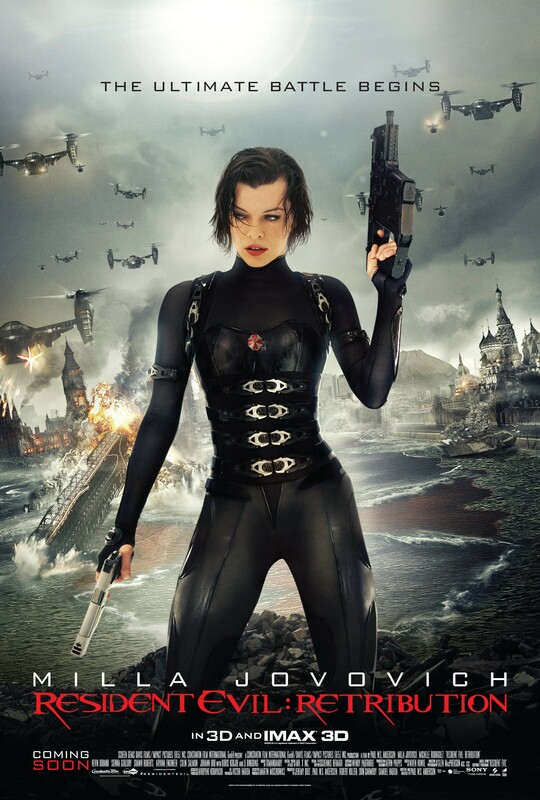 Alice (Milla Jovovich), now back in the clutches of the Umbrella corporation, must team up with an old enemy to escape Umbrella's super secret underground training facility. "Resident Evil: Retribution" is once again written and directed by Paul W.S. Anderson. It stars the returning Milla Jovovich as the now-not-so-super-soldier Alice who, despite losing her superhuman abilities in the previous installment, still manages to do some pretty physics-defying stunts. Like many times before, Alice wakes up, almost naked, and finds herself in the clutches of the Umbrella corporation. She quickly dons a tight leather outfit with tons of needless buckles that she managed to put on in just a few seconds. Now dressed for battle, she must trust an old enemy so she can fight her way through a secret training facility and again escape the clutches of Umbrella, which is now run by The Red Queen from the original film. That's not all that's back in this fifth film in the series as Michelle Rodriguez shows up again despite being killed off in the first film. Dat you, Lettie? This new version of her character Rain is obviously a clone, and there are multiples of her in the film as there are several characters. A few other thought-to-be-deceased characters pop back up as well because why the hell not at this point? Logic and good decisions went out the door halfway through the original "Resident Evil" film. This clone storyline only serves as a way to bring back old characters and to try and close plotholes about Umbrella's endless supply of soldiers, even during a zombie-like apocalypse. Where the previous Anderson directed "Resident Evil" films (the first one and "Resident Evil: Afterlife") have been methodically paced, even to their detriment, "Resident Evil: Retribution" goes completely in the opposite direction as this film seems like one giant, extended, endless action sequence. Overall, it is really just chaos comprised of a series of fights, shootouts, and car chases from start to finish. There is barely anything here that remotely resembles a plot or a proper narrative, but keep in mind, it *is* the fifth movie in a series that never really needed to be five films long. This movie is comprised of a group of people shooting guns at an endless supply of disposable villains with an endless supply of bullets. There are no real stakes, which has sort of been a running theme of the series for the last two films. Boooooring. Watching this movie is sort of like watching someone else play a video game at your house, except with a weaker narrative and far less fun. By the time "Resident Evil: Retribution" reaches its conclusion, it only serves to prove how pointless the last two films actually were. It's safe to say we have absolutely no ambition or hope for the "Final Chapter," that is, if it's the final chapter at all.